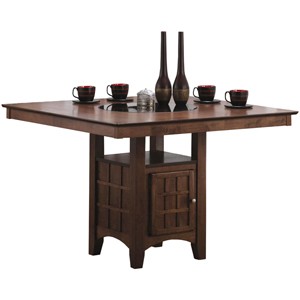 The Marcell counter-height dining table in a warm, medium walnut finish will be the perfect addition to your casual dining and entertainment space. The large square counter-height table offers ample space for guests to gather around with a built-in frosted glass Lazy Susan at the center for simple snacking. A handy storage pedestal base features a cabinet door with stemware racks and space to store wine and other items inside. A convenient shelf above the cabinet offers added storage and display space for keeping clutter out of the way. Pair with a bar stools from the Marcell collection for a casual contemporary style that will blend magnificently with your home decor. • Hardwoods solids and veneers. • Built-in frosted glass Lazy Susan at the center. • Storage pedestal base features a cabinet door with stemware racks. • 1 shelf above the cabinet offers added storage.